The basic features take care all the perspectives for doing business. A prerecorded menu that can be used to direct caller to different departments or extensions within your company. It is just like a never tired secretary taking customer’s call 24/7. All extensions come with full featured voice mail box. Caller can leave message, review the message and attach caller’s contact number. Your employee can access the recorded voice mail on extension. See the phone number of the person who is calling you before you pick up the phone. When you call out, this feature also allows other people to see who is calling them. Depend on where you located, you can pick an area code that is where you located from our 20 major city lists. You can also pick a number that is not physically local to you. Say, you are in Toronto; you can pick a Vancouver local number. You can get as many extensions as you want for your employees. Each extension has its own standard function for your employee to handle the call, improve the image for your business. Recording your own personal greeting for busy and no answer. You can change your personal greeting as often as you like. Simply pick up the extension and recording your voice prompt over the extension phone. If the call is for other extension, you can transfer the call to the right destination using the call transfer function. The caller’s ID will be recorded in the voice mail. you can easily return the call using the Call Return feature. Yes, you heard it right. We are the only company that includes 20 major Canadian cities as free calling destination in the standard package! 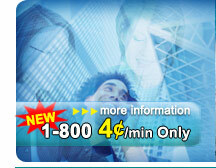 It has virtually makes your Canada Long Distance Free! We give the multiple phone lines for your business. The more extensions you are subscribing, the more phone lines you will get. Because we give you multiple phone lines. Even when all your extensions are on the call, you still don’t need to worry about the busy signal; your customers can still dial in and hear the company’s greetings. You can check you online call records, as well as long distance charge. You can even check the miss call on line so you will always know who is trying to reach you. All the monthly charges and invoices are clearly stated in your own customer portal on-line. You can print out the invoice at your own convenience. All business customers have their own online portal, you can review the call records, update your company information, and print out the billing invoice. With only $5 dollar more, you can get it all. All the basic features plus the following advance features. Sending the voicemail message as e-mail attachment to your assigned destination e-mail address. Voice mail notification light will go on if there are some recent voice messages. A more professional call reception, your customer will hear the music when you hold the conversation. When you temporarily do not want to answer the call, enable the Do Not Disturb will direct caller’s call into your voice mail. You can enable and disable the feature over extension when needed. You can forward the call to other phone number including cell phone number. Ring several extensions at once in one department. The first person who picks up the extension will answer the call. Ring a certain group of extension at the same time. The first person picks up the extension will answer the call. Prioritize the sequence of answering the call. If the first extension is on the phone or no answer, the call will flow to the next extension in the queue. Pick up other extension’s call, when the call is not answered. This feature will make sure you can balance the company workforce on answering the call. 8-way Conference Room is the add-on features for your existing Hosted PBX Services.